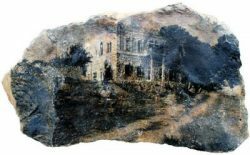 Artists reacted to the catastrophe of 1948 with paintings, graphics and sculptures incorporating memories of place and distance from homeland as a central theme. 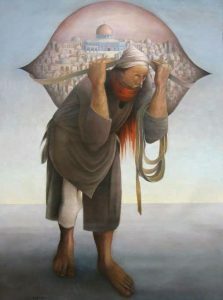 Artists of the “Nakba Generation” include the doyen Ismail Shammout, Abdul Hay Mosallam Zarara, Naji Al–Ali, Sophie Halaby, Kamal Bullata, and Samia Halabi, the latter two still working today. 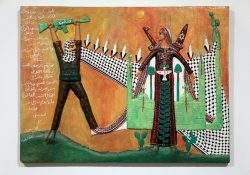 Next generation Palestinian artists continued the theme into contemporary works of art, including photography and film. 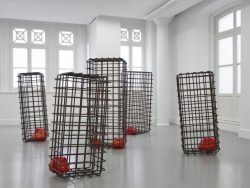 There are too many significant artists to list but a few of this group include Sliman Mansour, Bashir Sinwar, Mona Hatoum, Hani Zurob, Steve Sabella and Larissa Sansour. 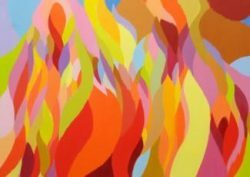 Samia Halaby “Women” Image © of the artist. 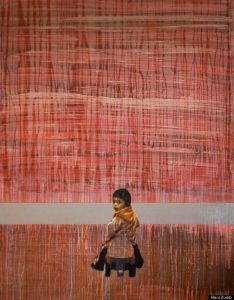 Courtesy of Ayyam Gallery. 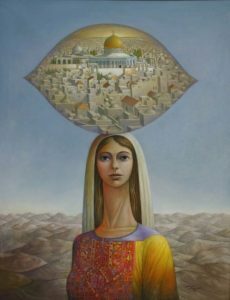 Sliman Mansour “Woman of Palestine” Image © of the artist. Mona Hatoum “Turbulence” Image © of the artist. Steve Sabella “Till the End” Image © of the artist. Ismail Shammout, “The Road to Nowhere” Image © of the artist. 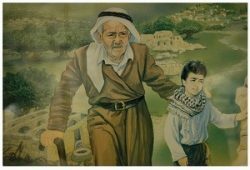 Bashir Sinwar “Remembering Our Village” From the Palestine Poster Project Archives. Image © of the artist. Ibrahim Hazimeh “Palestinian Land of My Dreams” Image © of the artist. Sophie Halaby “Olive Trees” Image © of the artist. 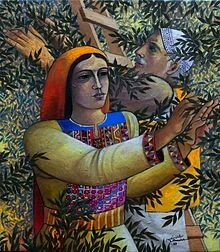 Sliman Mansour “Olive Picking” Image © of the artist. 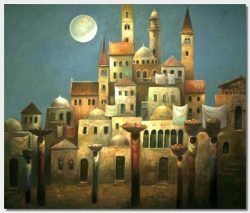 Abdul Hay Mosallam Zarara “Oh Homeland, Oh Night” (Sharjah Art Foundation Collection) Image © of the artist. 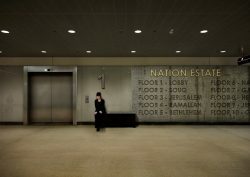 Larissa Sansour “Nation Estate” Image and film © of the artist. Naji Al–Ali “Kanaan 48” Image © of the artist. Hani Zurob “Flying Lesson#3” Image © of the artist. 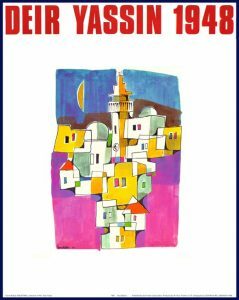 Kamal Boullata, “ Dier Yassin 1948” From the Palestine Poster Project Archives Image © of the artist. Sliman Mansour “Camels of Hardship” Image © of the artist. 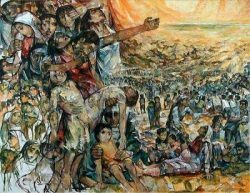 Ismail Shammout “A Lover from Palestine”…. 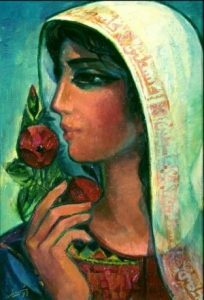 by Mahmoud Darwish ‘Her eyes are Palestinian/ Her name is Palestinian/ Her dress and sorrow Palestinian’ Image © of the artist.